"I'll be ready for an embroidered body bag by the time I reach 2,000 ATY miles." I've mentioned previously that many of the runners at Across the Years are veterans who have run the race previously. Bill is one of four participants this year, all in the 72-hour race, who reached the first "jacket level" of 1,000 lifetime miles run in the race. The others are Karsten Solheim, John Radich, and Christopher O'Loughlin, whose 999.81 miles were rounded up to 1,000 to his immense relief. That was an emotional finish! A total of fourteen runners have tallied up 1,000 ATY miles or more. These guys still have a ways to catch front-runner Harold Sieglaff, however. 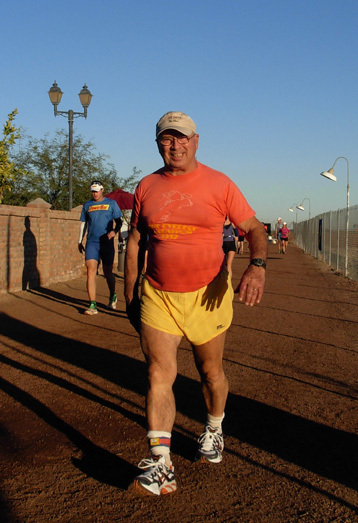 After running the race the first 23 years, Harold, one of the race founders, has racked up an amazing 2,426.22 lifetime ATY miles and is the only person to have a 2,000-mile jacket. He hasn't run the race since 2006 so Jim and I haven't had the pleasure of meeting him yet. I hope he will return next year. Martina Hausmann will probably be the second runner to reach the 2,000-mile level if she shows up again in 2009 and runs at least 153 miles (shouldn't be a problem; she got 231 this year). You can find all kinds of interesting race data at this link on the ATY website. The "lifetime ATY miles" list includes everyone who has run the race, the last year they ran it, and their total ATY miles so far. After two years, Jim has 191.38 miles. I have only 157.21 miles. To paraphrase Bill Dickey's quote, I'll probably be ready for an embroidered body bag before I even get a 1,000-mile jacket, unless I can still crank out some miles after getting both knees replaced in the future! Other categories of race data on the website include the winners of each race each year, top age group performances by race and year, single age records for each race, how many have run each race each year, names of runners who've done ATY five times or more (Harold wins that one, too), all race data since 1983, and interesting statistical trivia. One of several reasons I wanted to run on Day 3 this year was to be in the middle of the drama of the final finish of the race. 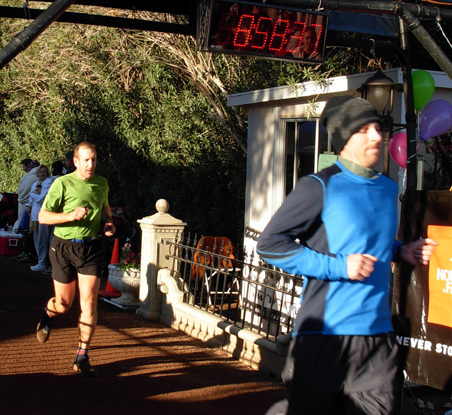 The first wave of the 48-hour runners and the first two waves of 24-hour runners finish before New Year's Day, which is the grand finale when the majority of the runners end their races. 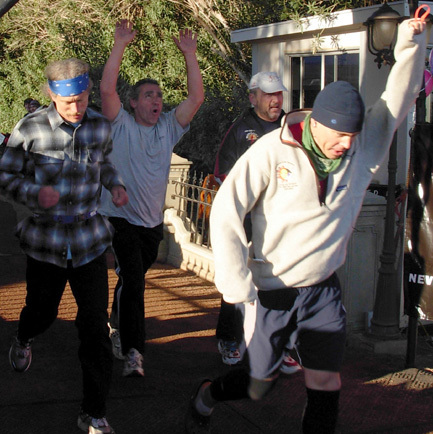 This year there were up to 84 of us finishing as closely as we could to 9 AM on New Year's Day. It's about the most exciting thing there is at ATY besides the fireworks nine hours earlier! congratulate each other at the end of their last lap. In a way, the last ten minutes at ATY remind me of the hold-your-breath finishes at the Leadville 100. Spectators and runners who are already done stand at the finish line, cheering in the last ones on the course and speculating whether the runner you can see in the distance is gonna make it across the line before the time runs out. It can get downright emotional, whether someone just makes it under the gun or just misses it. At North Carolina's Hinson Lake 24-hour race runners can keep going on their last lap and whatever partial mileage they get, counts. They stop if/when they hear the air horn, drop a banana with their name on it -- no joke! -- and the RD/volunteers come around to measure their distance. At ATY you don't get credit for a partial 500-meter lap so there's not much incentive to go out one more time if it's pretty obvious you aren't gonna make it. Spectators start to gather at the finish line to watch the last ten minutes of the race. That's Mike Brooks (72-hours) going under the banner with me. That doesn't stop some folks from trying, which makes the ending even more fun. I couldn't believe some of the amazing sprints the 72-hour runners, especially, pulled out of their legs the last few laps after looking like the walking dead all night! There's an innate drive in many runners to eke out the very maximum distance when we can smell the barn at the end. It's no different than the finishing sprint you see at shorter races on the roads or trails, just more incredible when you see a zombie do it that's been out there circling the track for 48 or 72 hours. The most dramatic finish this year had to be that of Christopher O'Loughlin, the generous RN who takes time off the track whenever someone needs foot care or other medical treatment during his 72-hour race each year. He's is the fella who pre-taped my feet (photos in the December 30 entry), bless his heart. While I was on the track the last night I got to observe Chris' valiant effort to reach his goal of 122 miles so he'd earn his 1,000 ATY-miles jacket. Dr. Andy Lovy generously took on extra medical duties so Christopher could remain on the track as much as possible. His daughter Sinead walked with him many laps during the night. In the morning Rodger Wrublik and other friends paced him. Several laps from the end, Chris sat down on the concrete bench next to our personal aid table. I was afraid he'd stop short of his goal but he had so much encouragement (and some food) that he was able to get back out on the track again. As you can see in the photo above, he was giving it everything he had. There were all sorts of emotions evident on the faces of the runners as they crossed the timing mat during the last few minutes of the race. Here are a few that Jim captured. The next three race winners finished knowing their positions were secure. That would be enough to make me smile, too! 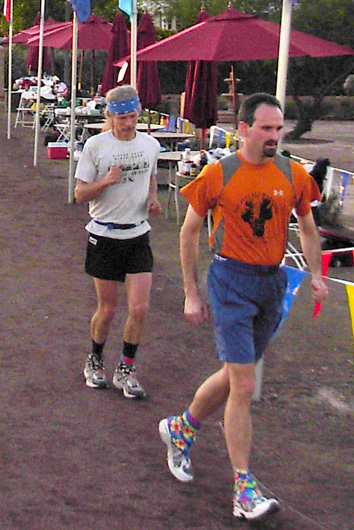 Aaron finished third in the 72-hour race with 233 miles and Michael was fifth with 217 miles. Neither one looks like he's been out there for three days, pushing hard! Aaron really had to push hard on New Year's morning after over-sleeping during his last nap. He ran like crazy the last few hours to make up for lost time and surpass Martina Hausmann by just over one mile. He wasn't able to quite catch Juli Aistars, however. She beat him by about 2� miles. That was great entertainment for folks who were watching the leader board Thursday morning. Some of the best stories from this year's race involve runners from the younger and older age brackets. Let's start with the older men . . . There's our buddy Dan Baglione from Foresthill, California, "five miles from the Western States Trail," as he says in his e-mail signature. 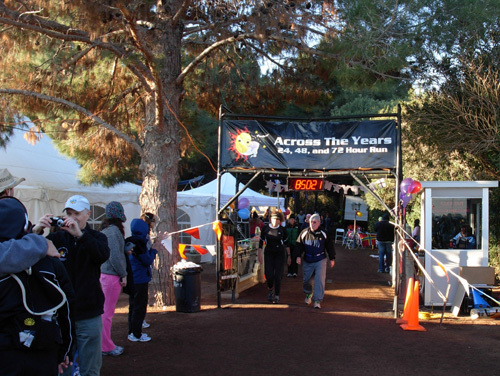 Dan, age 78, was the oldest man participating in ATY this year -- and he chose the grueling 72-hour race. After a rough first day I was afraid he'd stop but he persevered, found a second wind, and completed just under 101 miles. He finished ahead of ten other competitors, several a fraction of his age. 'Way to go, Dan! Dan Baglione gives me a big smile on Day 2. There were three other 72-hour runners in their 70s and all placed well: Karsten Solheim, 71, 11th out of 50 with 188 miles; Ron Vertrees, 71, in 27th place with 148 miles, and Andy Lovy, 73, 36th with 111 miles. 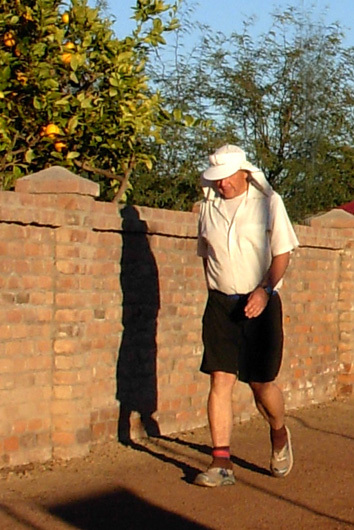 Nine men from age 61 to 69 ran and walked for three days, placing as high as 8th with 204 miles. That would be ultra walker Ulli Kamm, who is living proof that you don't have to run to finish a trail 100-miler like Bighorn or to place well in a fixed-time race. There are similar stories in the 24- and 48-hour races, too. Jeff Hagen, 61, cranked out fifteen more miles than the second-place finisher, age 40, in the two-day race with a total of 180 miles. He also raised the bar extremely high for Jim if he decides to run the 48-hour race next year at age 61! Jeff's single-age ATY record may stand for a while. Hans Bern-Bauer graciously takes a photo of the guy who beat him in the 48-hour race. Now tell me in how many other sports, or even road marathons, would you see sportsmanship like this? It's one of the things that makes ATY so special. Jim was one of four men 60-69 in the 48-hour race. 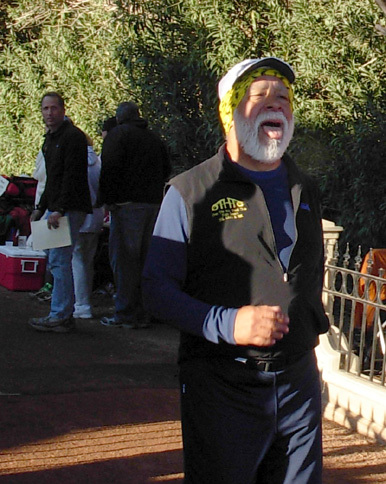 Don Winkley was the only 70-year-old in that race this year. He reached 103 miles in two days. 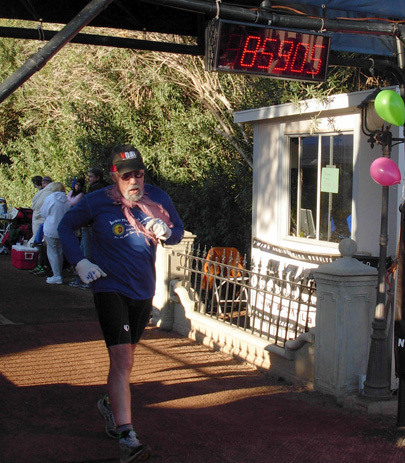 There were also two men in their 60s in the 24-hour races. Considering how many men in their 60s and 70s compete at ATY each year, it was a surprise to me that there were no women in this year's event who were 60 and over. It was an even bigger surprise to me when I was looking at the results after the race and realized that I was the oldest female competitor in any of the races this year!! (I'll be 60 in March.) At first I didn't quite know whether to just feel OLD or to be proud! Considering the problems I've had training and racing to my expectations in the last decade, I'm quite happy with the 82 miles I racked up in the 24-hour race and my placement among the contenders of all ages (16th of 48 runners). That's one of the highest finishes I've had in years and I improved the previous F59 ATY single-age record from 70 to 82 miles.. 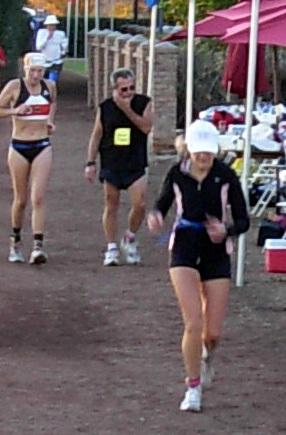 The first female in the 24-hour race, June Gessner, is 55 years old. 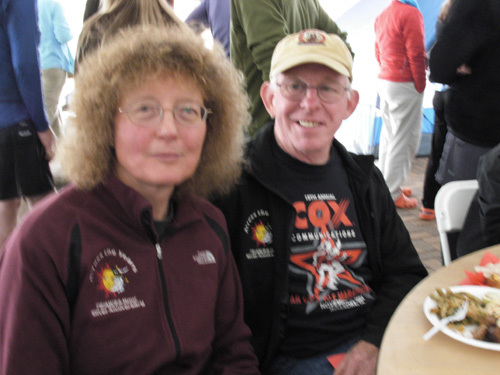 She was 6th overall and ran 102 miles on the third day, outdistancing men and women half her age. There's a photo of her farther down in this entry. Juli Aistars, also age 50, not only was first (and oldest) female in the very competitive 72-hour race, she also ran 235 miles to place second overall out of 50 runners!! 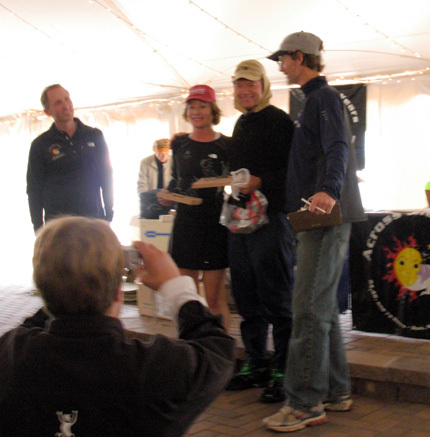 awards ceremony with men's 72-hour winner William Sichel, age 55. Juli had a great story to tell the internet ultra list about her competition with German runner Martina Hausmann, who was first female in that race last year. Juli allowed herself to be out-psyched by Martina last year (Martina has a reputation for being a fierce competitor and sometimes stares down her opponents). Juli and Martina really pushed each other this year but talked more and came to a better understanding of what makes the other "tick." Their styles of competition are very different, but both are relentless on the track. What an example these older winning women are for their younger counterparts! One of the most inspiring performances during the race was that of John Geesler, who is the only person besides the amazing Greek ultra runner Yiannis Kouros to reach 300 miles at ATY in the 72-hour race. John is a very personable guy and a perennial favorite to win each year. John Geesler follows Brian Kuhn around a corner of the track on Day 1. This year John either arrived at the race with a foot problem (reportedly a heel spur) or developed one the first day on the track. Instead of withdrawing from the race and flying back home to New York, or spectating the rest of the week, he gamely hung in there for two more painful days, walking relentlessly around the track. (Relentless: there's that word again.) Instead of whining, he encouraged the other runners and humbly accepted their words of sympathy and empathy for his injury. He exemplified being a champion in a different manner than winning the race. 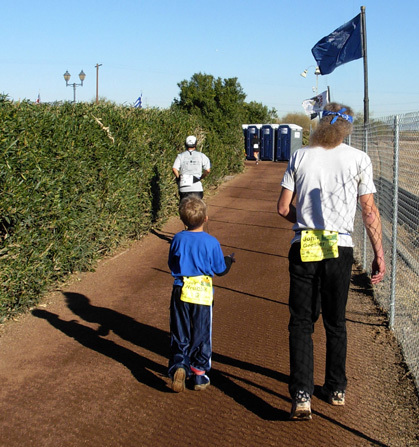 One of the best stories during the race is about the relationship that grew between John and little Gavin Wrublik, Rodger's seven-year-old son. John has been a house guest of the Wrublik family during previous races so Gavin already knew him, but this year the pair got to spend lots of quality time together on the track since John wasn't cranking out his usual number of miles. It was just great to see the two of them walking together lap after lap, deep in conversation: the master and the apprentice. Juli Aistars wrote to the ultra list a couple days after the race: ". . . I heard John telling Gavin that he had the 300 mile buckle and the 200 mile buckle, and now he would get the 100 mile buckle. I have a feeling Gavin is going to remember these words at other times in his life and use them to his advantage. There are always so many wonderful things that happen at this event that are not about who wins or the running . . ."
Gavin and the other young runners all make for some good ATY stories. There were four teenagers from age 13 to 18 and three elementary-age children in the races this year and they all turned in some amazing performances! Let's start with Gavin, the youngest son of Hosts Rodger and Tana Wrublik. Last year Gavin begged to be in the race so Dad gave him a number and timing chip. At age six he ran and walked a total of 7.7 miles in three days and had so much fun that he begged to run again this year. 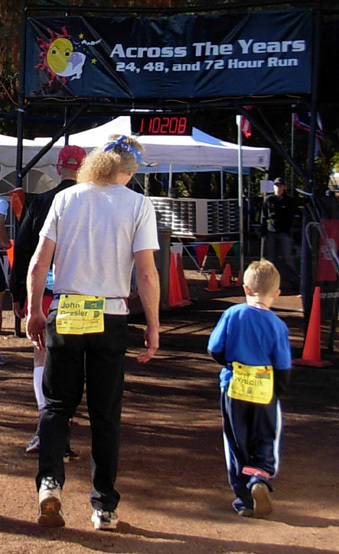 Dad wisely entered him in the 72-hour race again so he could have fun throughout the whole race and not feel pressured to run too much in one day. Ha! Gavin ran and walked 22 miles the first day! It was a joy to watch him sprint a few yards with Jim, Aaron Doman, the Coury brothers, and some of the other runners he knew the best. He also played soccer and chased the other kids at the race on the front lawn, skateboarded on the driveway, and acted like a seven-year-old kid all day long. Rodger said he didn't think Gavin would even be able to get out of bed the next morning, he'd be so sore. Guess who came down to the living room with a big smile on his face early on the morning of Day 2 while I was checking in runners?? Gavin, eager to get out on the track again with all his buddies like John Geesler! That amazing young man sprinted, ran, and walked an official total of 50.331 miles around the track over three days -- and that doesn't begin to include all the bonus mileage he did playing on the front lawn and going to and from the house! Then there is Cayden Wrublik, one of Rodger's grandsons, who is age 5. He was all excited about the race and wanted to run, too. 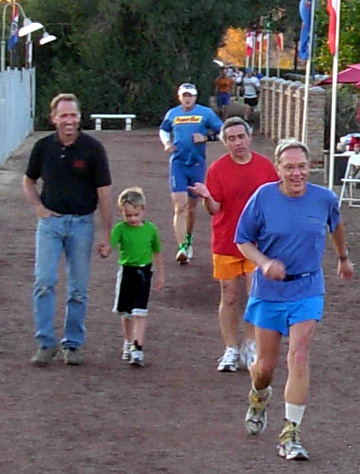 What a cutie, running around the track with Gavin and the other young runners in the race or walking with his mom, Erica, or Grandpa Rodger. That little squirt accumulated 17.7 miles in three days, with similar additional mileage from playing all week like Gavin did. Ulli "The Walker" Kamm (blue shirt) look happy on Day 1. No one forced these young kids to run out there. In fact, no one could STOP them. It was play to them, just like the soccer, skateboarding, and chasing each other around the yard. And it made some of us oldsters feel a little bit more like kids ourselves! Next there's Ethan Pence, age 11, who ran the 24-hour race for the third time. At age 9 he ran and walked 27 miles. At age 10, 35 miles. This year he ran 40 miles in one day. He comes by this naturally: his father ran 84 miles and his mother 100 miles on the same day. Heredity or environment? 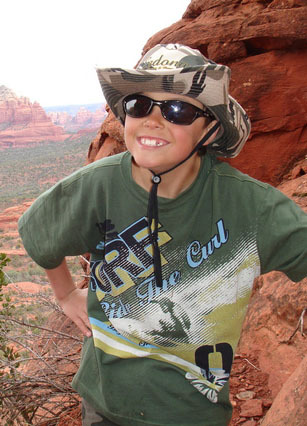 Aaron Doman, age 13, has also run ATY the past three years. 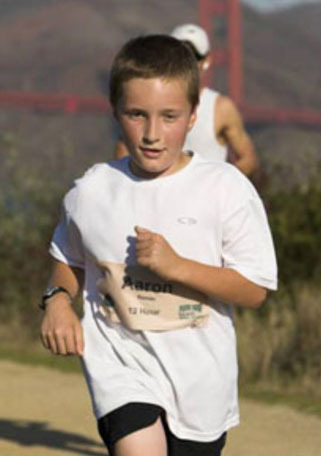 In the 24-hour race he accumulated 22 miles at age 11 and 50 miles at age 12. 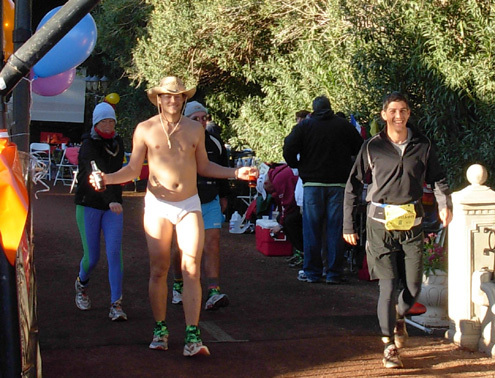 This year he ran the 72-hour race and reached his goal of 100 miles. And talk about doing what comes naturally: his parents, Sarah Spelt and Wendell Doman, direct a very large and popular series of ultras in California, including the San Francisco One-Day Run. ATY is a family affair for them. This year Wendell crewed for his wife and son the first two days, then ran the 24-hour race on Day 3. He won the race overall with 124 miles. 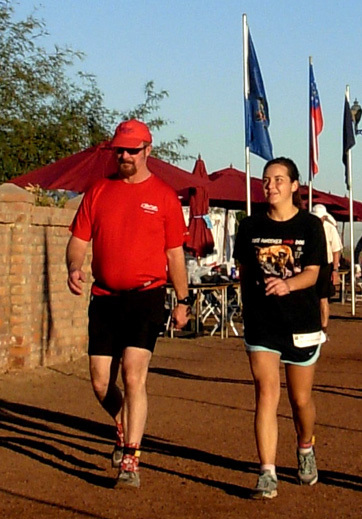 Sarah ran 84 miles on the first day, then crewed for Aaron and Wendell the rest of the race. Cat Cuda shares the track on Day 1with Brad Bonnett, brother of RD Paul Bonnett. Catherine "Cat" Cuda is next. Now 16 years old, this is her sixth time running the race! She started when she was only 11. 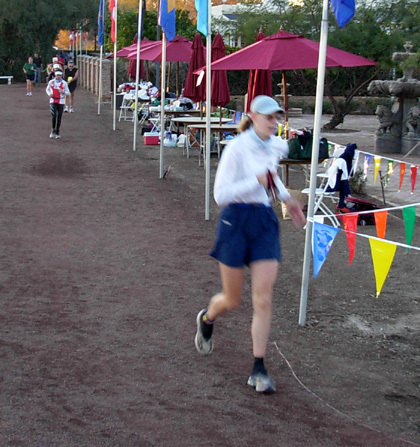 Her mileage has ranged from 27 miles to 69 miles (this year) in the 24-hour race. Cat is the daughter of Frank Cuda, a member of ATY's race management team. Two 18-year-olds did quite well for themselves this year, too. 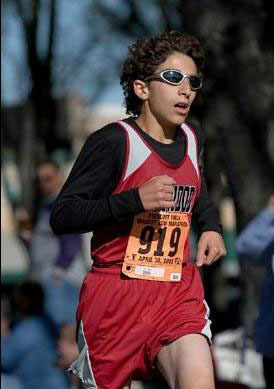 Nate Coury, youngest son and brother of the Running Coury Family, ran 100 miles in the 24-hour race on Day 1. This year he outdistanced his two older brothers, Jamil and Nick, and his father Peter. The young men and their mother Patty worked many long hours on Day 3 to fill a volunteer void in the aid station. That's the day Peter ran. It was great to benefit from their cheerful faces and generous spirit while I was out there on the track that day. Nick Hollon, also 18, was a late entrant into the race. I believe he made it off the wait list only a couple days before the race began, getting in after a last-minute withdrawal by another runner. 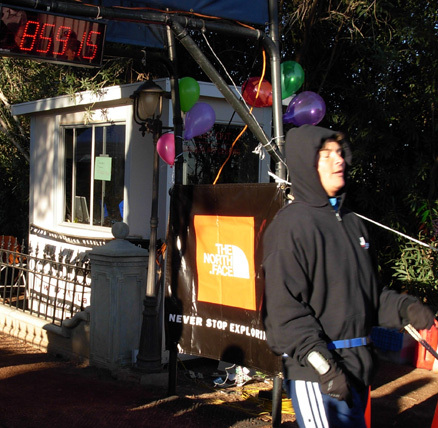 Nick had a goal: to set a new age-group record. I forget what he told me the old record was (we were both running on Day 3), but he did get a record with his outstanding 107 miles in 24 hours! 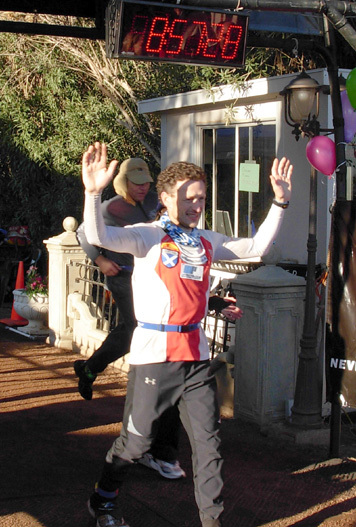 He placed third overall out of 48 runners in the 24-hour races and won the "under 40" (open male?) category. 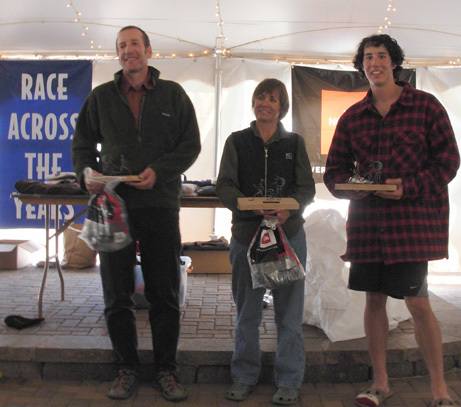 Happy 24-hour winners: L-R, Wendell Doman, June Gessner, Nick Hollon. I think we'll be hearing a lot more from these young men and women in the future! It takes a lot of maturity to run and walk around a track for so many hours, days, and miles. I think it's great that an increasing number of runners in their teens, 20s, and 30s are becoming involved in ultra running in recent years. 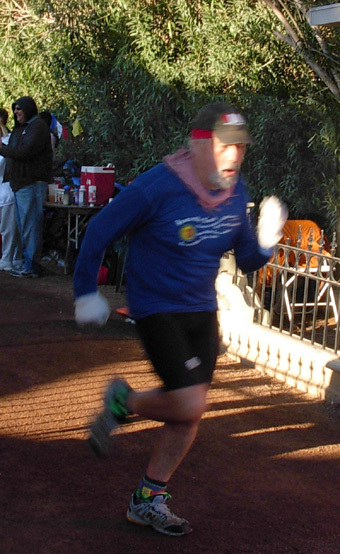 When I moved beyond the marathon distance in 1992 the sport was dominated by middle-aged and older folks. Both the older veterans and the younger, newer participants have a lot to give to each other. Nothing symbolizes that better than those heartwarming images of John and Gavin! When the last runner has crossed the finish line at 9 AM on New Year's Day there's a whirlwind of activity during the next hour as the big tent is transformed from runners' "tent city" to site of the awards brunch. 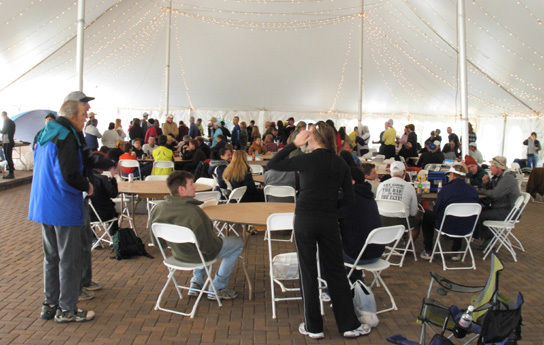 Runners are encouraged to fold up their tents and cots as quickly as possible, or at least move them to one far side of the tent, so large round tables and dozens of chairs can be set up for the meal and awards presentation. 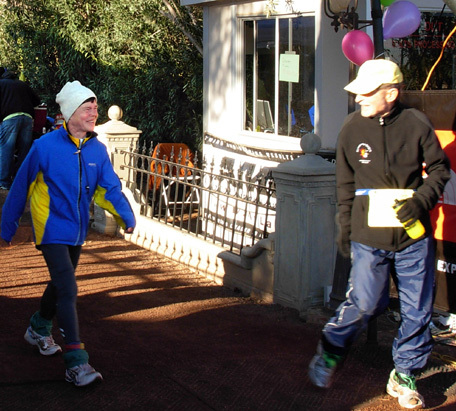 while other runners line up in the background for brunch. 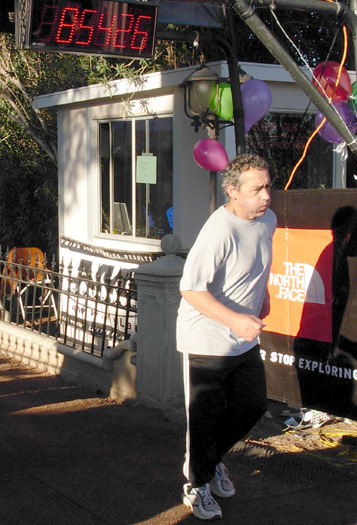 About two-thirds of the runners attend the awards brunch on the last morning of the race. There are smaller awards presentations after the first two days' races for those runners who aren't able to stay until New Year's Day. That's a great solution, but it's more fun if runners can delay their departure until after the full ceremony. Paul and Rodger do a wonderful job of noting each runner's accomplishment and allowing runners to tell stories about the race. Even though everyone present is tired from running, volunteering, or crewing for one or two or three days, it's a great way to end the event. "Zombie" award as RD Paul Bonnett (R) looks on. 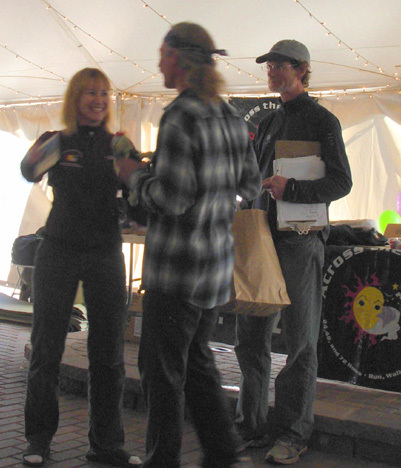 This year Zombie Runner Gillian Robinson (above) made a special presentation of "Zombie" dolls to John Geesler and Heike Pawzik for their tenacious efforts in the 72-hour race. 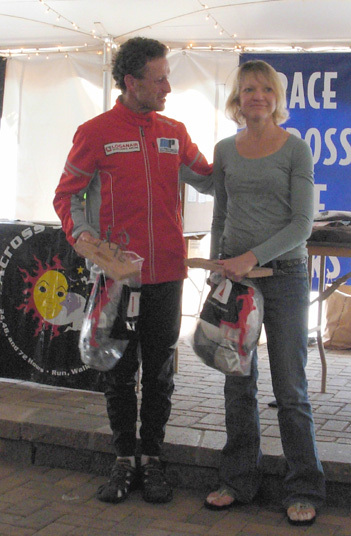 Other special awards and kudos were given to outstanding volunteers, without whom the race wouldn't happen. 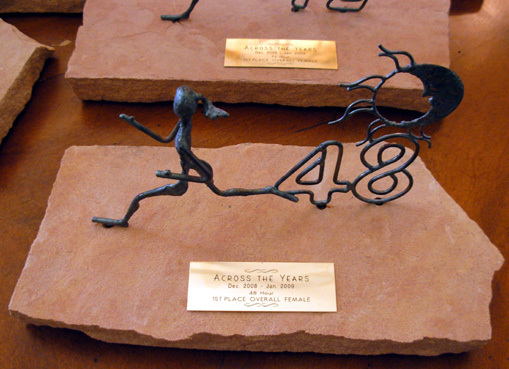 Each runner receives an award. Those of us who don't reach 100 miles get a tall, hefty glass mug with the ATY logo etched into it. 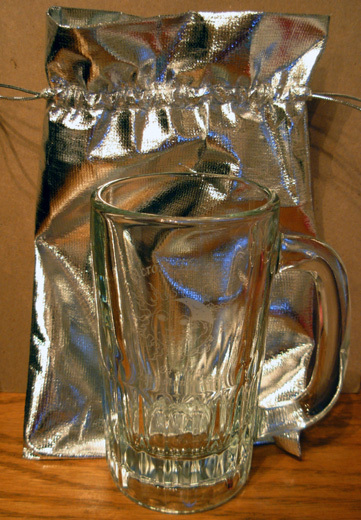 Since this was the Silver Anniversary, the mugs and buckles came in soft silver lam� drawstring bags -- very classy. 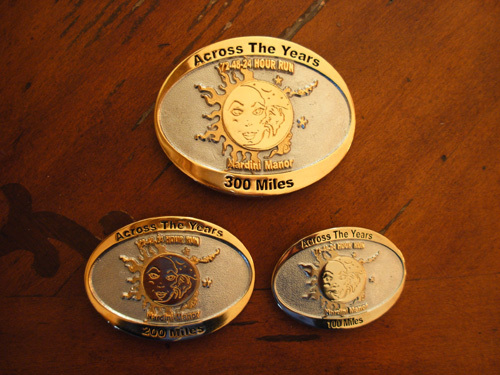 The distinctive belt buckles for runners completing 100, 200, or 300 miles (below) were also upgraded this year to reflect the Silver Anniversary. They are an attractive two-tone silver and brass design. The sizes of the 200- and 300-mile buckles were changed this year, too. They are progressively bigger to reflect the distances. The 300-mile buckles are still awaiting a recipient, however -- no one earned one this year. (William Sichel came the closest with 269+ miles.) The coveted 300-mile buckle has been awarded only two times in the race's 25-year history: to John Geesler in 2004 and to Yiannis Kuoros in 2005. Maybe someone will earn one in 2009 . . .
Use this link for complete race results. Click on runners' names for their "bios" and photos. Click on their numbers for lap splits and distances. There is also a lot of other information about previous race winners, single age-group records, and other statistics on the race website. Then suddenly, it seems, the whole event is over. I hate that part, when everyone goes home again. (Or hits the road like we do for the next race. We aren't the only ones who live like this!) It'll be great to see some of them at other events in a few weeks or months but some we won't see for another year, when the ATY Family has its next reunion in December, 2009. Thanks to all the caffeine I consumed in the previous 24 hours I was able to stay awake through the awards ceremony. Soon after, however, I was ready for a long, long nap. I don't remember much of anything from the afternoon or night of New Year's Day. What, me tired?? Jim definitely looks more rested at the awards brunch. Jim had already had a day and night to rest so he hung around outside on New Year's Day to help Rodger, Paul, and other volunteers dismantle tents and the start/finish banner and framework, relocate tables and chairs for the next wedding reception at Nardini Manor, carry computer equipment and large projection screens back to the house, etc. Although he was tired from his two days on the track at the beginning of the week, the stretching and moving around probably helped his recovery. It was sad to say our final goodbye to the Wrubliks. We promised to stay in touch and become even more involved with the race in the coming days and months -- whatever we can do to help via our computers. We can't commit this much time to every race we run but we will to Across the Years because it has become very special to us. Oh, and that truck problem we had right before the race started? While I was running on Day 3, Jim and Rodger diagnosed a starter problem. We always bring along our truck and camper files on trips like this. Jim found the receipt for the starter he purchased eleven months ago -- i.e., still under warranty. He got a new one at no additional cost and installed it fairly quickly himself. Problem solved, but the timing of it caused him a lot of concern during his race when he couldn't investigate it. As our truck and camper age, there's always something to repair or replace. We're relieved this problem occurred when and where it did and not out in the middle of nowhere.